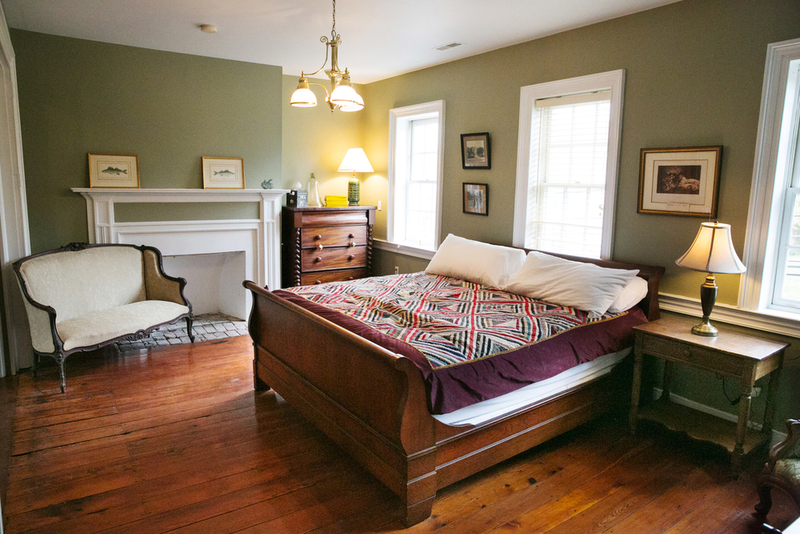 The Light Horse Inn has seven suites available by the night, weekend, week and by the month. All of our rooms have private en suite full bathrooms. Each night's stay includes a hearty delicious breakfast plated hot in our spacious breakfast room. 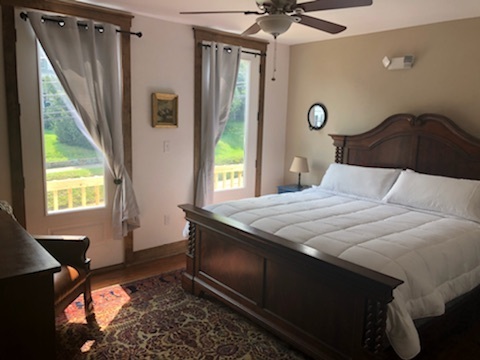 The Light Horse Inn has been voted the best place to stay in Harpers Ferry! This large suite has a king size bed, ten foot ceilings, jacuzzi tub and separate shower. This spacious suite will allow you lots of room to spread out and relax. When the building served as a tavern and inn from the 1790s this room was used as the public section for sleeping quarters, with eight or more people sleeping in the room. It was also rumored to have been used for dancing. The original heart pine floors have been preserved and numerous architectural details are showcased as well. This suite has beautiful antique furniture throughout. Welcome to our large ground level suite. Built in the original stone cook house. Enjoy the beautiful stone walls that tell a story of early settlers and their labor. This room is handicap accessible and has a private entrance. King size bed and lovely light filled spacious en suite bathroom. Photos, availability and pricing coming soon! The best of both worlds! This is our second largest suite and is architecturally intriguing. Guests can see several past renditions of the structure from their king-size bed. There is a separate sitting room and the en suite bathroom has a lovely deep clawfoot tub (with shower head). In 1790 this room was the private suite and used for ladies who could afford to pay the private room fee or for distinguished gentleman who did not want to board with the general population. This lovely suite has a king size bed, nine-foot tall ceilings and a private bath with tub and shower. Light filled comfort with views of the historic town. King-sized bed iron bed and marble tiled shower in the en suite bath. This is the top floor of the inn and is very spacious. This is where the inn keeper, his family, and staff would stay. They also used it for guests as well when the inn was particularly busy. Today it has a small modern kitchen, large living area, queen size bed and private bath. Suite 3 is at the top of the house.The original historic staircase leads up to this spacious suite with expansive views, window seats and original flooring. This room looks towards Maryland Heights Ridge and has a lovely warm feel. Large walk in shower with marble tile and rain head. Please click above to Search Availability Online at Harpers Ferry Getaways, our direct booking site. 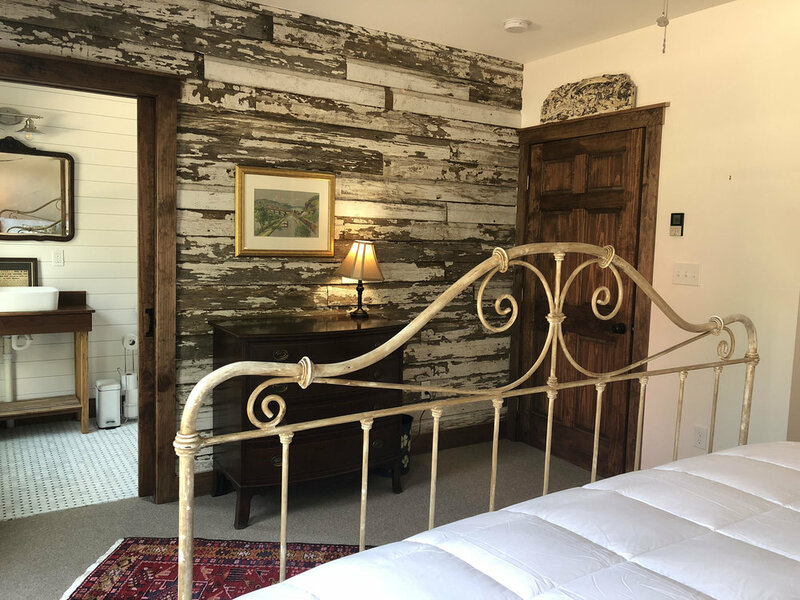 Please note, we do have multiple property options in Harpers Ferry and the results of your date seach may show more than just the Light Horse Inn options. Looking to gift a getaway to a friend or loved one? Click below to access our Gift Certificates page. These are sold in custom monetary amounts and can be used for any of our lovely suites.